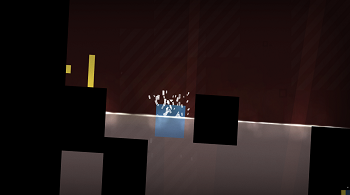 Mike Bithell's indie title Thomas Was Alone has managed to sell 700,000 copies across various platforms. Mike Bithell, the creator of the indie game Thomas Was Alone recently revealed that the game, which has no received no small amount of critical acclaim, has been selling pretty well too. Speaking to Joystiq he confirmed that rectangle populated platformer had, to date, sold nearly 700,000 copies. While perhaps not a success on the triple-A scale, it's a substantial achievement for an indie game, especially one that was, according to Bithell himself, made pretty much on a whim to cure some boredom. The 700,000 copies were sold across an eclectic mix of platforms that include PC, Mac, Linux PS3 and Vita. Bithell confirmed that the total doesn't include any copies gamers received for free via PlayStation Plus. The runaway success of Thomas Was Alone has, in turn, allowed Bithell to quit his day job and focus on his next game, the stealth-centric Volume. While we're sure Bithell hopes to see Volume reach similar heights of success, we'll have to wait and see if it can accomplish that. One could make the argument that Thomas Was Alone had a unique charm owed in no small part to the simplicity of its visuals and gameplay. From what's been shown of Volume, it will be a more complex game, perhaps losing some of the pick up and play qualities of its predecessor. Only time can tell however, if that will be the case and, either way, we're still excited to see what Bithell delivers in the future.